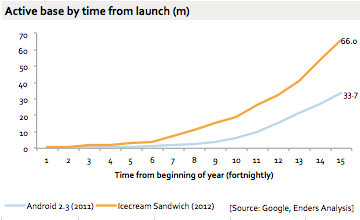 This chart compares the rate of penetration of Android 2.3 and 4 (ICS) by time from launch. It looks like ICS is now about 8.5pp behind where 2.3 was at the same time. There are LOTS of problems with this comparison, of course. I’ve picked the start date as the point that each version started showing up in the Google data, which is certainly at least debatable. And the data is based on devices connecting to Google Play, which may not be entirely representative: one might expect newer devices to be going to less techie people who use Play less. And there is of course a mathematical effect: the total base is larger, so the ICS figures are being divided by a larger base than the 2.3 numbers. This is what happens if I apply the Google stats to my model of the Android base. This is a pretty rough model, because Google doesn’t give us much to go on. But it’s good enough for a comparison. Essentially, ICS is selling at twice the rate of 2.3, but it is making a much slower impact on the overall Android base, simply because the base is so much larger than it was and the upgrade rate for existing devices is so low. This chart gives a different perspective on the issue: devices with the new OS come into the base, but devices with the old OS go away very slowly.